I realize this is a very broad title. I have just today finished a design going into a book for SoHo Publishing, publishers of Vogue Knitting. I normally don’t work under a deadline as I am frequently sick and we are renovating. But from time to time I do projects that go in a book or magazine and I have to ramp things up a notch and move at a different pace. The process of creating a design from conception to completion is rather like giving birth. It is thrilling, challenging, and exhausting. There are labor pains along the way. And when you hold it in your hands you can forget about those pains. This little garment I have been working on is a baby sweater that has been fraught with little difficulties. I had trouble getting gauge to be consistent between swatch and garment, from flat to in the round, and from double pointed needle to circular. Of course, since I am an extremely loose knitter minute changes are amplified in my knitting. In the end, I did probably 10 swatches, did the sleeves twice, and redid the yoke 4 times altogether. It is awfully cute and will be two days late. Of course this is with communication with SoHo. I would much rather have a design done the way I feel it needs to be done and if it works with the publisher’s time frame be two days late, than rush it through and not be right. Or done not as good as I know it can be. It has been a draining process. In all honesty, I have worked on little else and am looking forward to working on some hat designs I have in mind. My mind feels like jello at the moment but when I look at it, I am so proud of how cute it is. And I do feel very satisfied. When the book is due to come out I will post pictures. The name of the design is Garden Party. My distributor would like me to design more baby things, perhaps I will add more to my line we shall see. As for this little project…one more read through the pattern, package it up and it is a wrap. I love photography. It is interesting the things that you can capture on film that you may not have noticed when looking at your surroundings, and inspiration abounds for colorways and textures that can be the springboard for interesting designs.It helps me appreciate things on a simple level, for the beauty present in our day-to-day lives that we take for granted or the humor that we can miss. I have had many photographs that have made me chuckle over the years of animals I have taken when shooting for design inspiration later, as they have their quirky personalities just like people do. This little guy is so cute. I know he looks grumpy or sad…perhaps he didn’t get enough treats today. I love the textures in this picture, aside from the appeal of the monkey itself. You have the texture of the fur contrasted with the texture of the log which is quite interesting. The colors are beautiful too, and show how fantastic neutrals with a punch of color can be. This would make an earthy and interesting colorway for a fairisle or other stranded knitting garment. Black, offwhite, greys, shell pink, and the gold to rust colors. 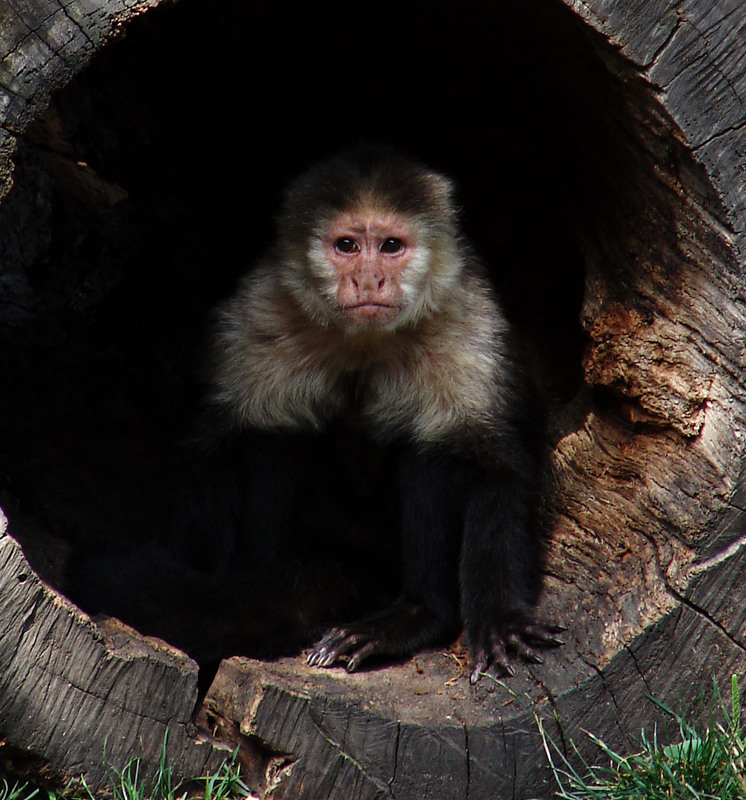 As with most of the animals I photograph, this one was snapped at a zoo…our local zoo, the Fort Wayne Children’s Zoo. It is a wonderful zoo and I love to go there and photograph the animals and the flowers. I hope you find inspiration in your day from little things as well as unexpected places. This picture is of a Blue Eyed Honey Eater that I took at our zoo, the Fort Wayne Children’s Zoo a number of years ago. I thought the colors were simply amazing and I had to take the picture. When I take photographs of animals at the zoo, I often look at colorways that I would not always think of, and this is a perfect example. Pea green, Black, Creamy White, Royal Blue, and a Pale Turquoise Blue. If you look close in the shadows around the toe of the bird, you can see a touch of pink that I think is some reflected color form the rusty bracket holding his food dish. I have a fairisle planned for this colorway, in Rauma Finnulgarn. Rauma is a good Norwegian yarn, and Finnulgarn is the only yarn I could find that had the right colors. You would not believe how many yarns I looked at in that weight to find the right color, and color for this design is critical. The colorway was an obvious choice because it is a distinguishing characteristic of this animal. It also has a prominent beak but I did not feel particularly inspired by that. My cat, oddly enough, will not leave that yarn alone. Whenever it is out, every morning when I get up I find balls of it scattered about the house. She has learned not to hide it or desecrate it or she is banned from the room. Gathering up the balls of yarn does get tiresome though so I do try and not to leave a colorway of it sitting out where it can tempt her. This picture was taken of one of our Orangutans. I happened to be at the right place at the right time and snapped this picture. Since it is behind glass I had the flash off. For those of you wanting to take pictures of animals at the zoo and they are behind glass, take the flash off and put your lens right up to the glass. The lens won’t “see” the glass then and you will get a better shot. Orangutans tie knots in vines in the wild, and in the Tropical Rainforest’s exhibit they have some samples of knots they have tied. It made me think of Celtic Knot work, so of course for this design I came up with an Aran design. A feminine one, befitting this lady of the Rain-forest. The Natives in the areas where the Orangutans live call them “Man In The Woods”. If I were going to do a men’s sweater, which I was at one time outside of the book submission, I would call it Man In The Woods. It would make a great name for a design. This particular design could go also with color as inspiration, it would make a beautiful colorway as well. Yellows to oranges to Rust Reds. Then there are the leathery Browns. Bring in some greens from the background foliage and it would be quite magnificent. Or, if you wanted to focus on texture you could go with Mountain Goat from Mountain Colors. It has a bit of a hairy texture to it, and they have a number of interesting colorways: I liked Yellowstone, Harmony Woods, Juniper, Ladyslipper, Moose Creek and Red Willow. A distinguishing characteristic of this animal is it’s hair, so a handpaint yarn in a simple stitch pattern would also be a good choice. She is quite beautiful, isn’t she? As you may have picked up, when you are inspired by something there are a number of ways you can go from your inspiration to your finished item. In knitting, our design elements are our yarns and by extension the properties the yarn brings to the party in texture and color. We also have as design elements stitch patterns, and the lines that are created by the stitch patterns which impact how the design is viewed and how it feels to us as we view it (does it feel energetic, restful, sporty, playful, majestic, etc). Do the stitch patterns lead the eyes to certain parts of the body that are flattering or unflattering? Do the parts of the design transition well from one area to the next? Is it an anomaly because it is supposed to be an anomaly? For example, when I plan out a sweater, everything is a design element. I do mean everything. Right down to the ribbing. That is why you don’t see plain ribbing slapped on every sweater I do. If I put ribbing on a sweater, it is because ribbing is the best solution, in my mind, for that design for the edge of that garment. And then I don’t just slap ribbing on it. Yes it takes a little planning to have a transition from your ribbing to your pattern, but it looks so much better. Later on when I have more swatches with stitch patterns with ribbing, I will have to scan them and post them so I can better illustrate what I am talking about. I am currently working on revising Calliope, a lace tank that was licensed by Knit Picks for a year. The Yarn that I am doing it in is Lyndon Hill, from Plymouth Yarns. Thank you, Plymouth Yarns, for the yarn support by the way. Lyndon Hill is much lighter in weight than Shine, and it is a nice Cotton and Silk blend. In the Photo, which is an old one, it is in Knit Picks Shine. It is so much prettier in the lighter weight yarn. The stitch pattern is basically a ribbed chevron of sorts that has yarn overs in it. Due to the nature of the stitch pattern, what I discovered in doing this design is that there is a lot of bias, or can be, when doing shaping. So for the armhole decreases in this pattern, rather than have the traditional directions where you have your initial BO and then dec this many on RS rows this number of times, what I was faced with was not only the stitch pattern itself, which had a central double decrease (the center line that the ribs point in to) separated from its paired decreases, but the pattern is in ribbing as well. So I want to keep it in pattern with the ribbing as well as have to keep in mind where I am at in the stitch pattern with regards to the yarn overs and their decrease. I normally work about a third of the stitches for the underdarm in BO 2 sts, and then a third in single decreases. It gives a nice curve to the underarm. What I found for the 2 st BO’s was that in some places because I was at a point in the pattern where I was working the double dec, but I was not far enough out to work the yo, that I had to dec one stitch instead of eliminate 2 (one was eliminated in the double dec, as it did not have a yo paired with it, so there would be a stitch decreased). In some places, I had to eliminate 3 sts, not 2, because I had worked a yo but would not be far enough in the pattern to be working that double dec. So I was fitting it in at the edge, between p2togs, k2togs, and sometimes more creative types of decreases. At one point, I needed to end up with that central decrease next to my selvedge stitch, and I had three stitches to eliminate. The one normally decreased on the left of it that paired with the yo on the left of it, and then the 2 sts at the right needed to BO for the armhole shaping. I still wanted to maintain that central line that I had going there. I inserted the tip of my RH ndl into the first 3 sts on the LH ndl as if to knit (the central stitch which is always on top, which is why there is an uninterupted line, and the 2 sts to the right), slipped them to the RH ndl, then did the same with the next stitch on the LH ndl and then knit the 4 together. This just arranges the stitchs so that the stitch on the left is on the bottom, and the one in the center is on the top. When working the double decreases for the rest of the garment I had been slipping 2 stitches, the central st and the one to its’ right, in the same way. Who says you cannot put them in the order that you want, or do it with more stitches than you normally would? Since Lyndon Hill is a fine gauge yarn, I could get away with it. If you were working in a worsted weight yarn this would be more difficult to do and have it blend in because of the thickness of the yarn. What I ended up with was the stitch pattern looking exactly as it always did exactly where it stopped. For this pattern, this level of scrutiny in where the decreases go and how they are done just gives a better finish at the edge. It might not be noticable to most as to why it looks so much neater, but it is the difference between a professional looking garment and one that just doesn’t look as nice. Those kinds of details are important to consider when designing. How do the decreases in shaping affect a stitch pattern, and do I need to do things a little differently for a better finish? Since I am going to a different yarn, I have to re-chart the armhole shaping for each size as it is different because the gauge is different. It took awhile to get things set up, but after I got going in Adobe Illustrator it was a little easier and I got the chart done for the first size. Today I hope to get a couple more done, and then I will be casting on sufficient stitches just for the armhole shaping and testing the shaping to make sure it is doing what I expect it to. Then it will be off to the test knitter. Those decreases and yo’s can bias a fabric when they are separated, and you will see them paired but some distance from each other in different types of stitch patterns. The best way to handle the edge of your fabric when shaping so that the fabric does not bias is to maintain that stitch pattern while working your shaping. I have been Googled for reviews on simple style and am happy to say I have found a couple. Knitting Scholar has one, and I am happy to mention that Kazumi was one of the 4 listed specifically that they liked, although they did say that there wasn’t much not to like in the book. I would have to agree, it is a fantastic book. Here are the designs mentioned that they especially thought were successful: ” Those are the exceptions, though. I really loved the Sixteen Button Cardigan with it’s basic shaping at the neck (and the fact that it can be worn with the buttons in front or in back). The Kazumi Pullover is classy with its simple ribbing with just a touch of lace at the bottom edge. I liked the Twisted-V Pullover a lot, and the Guernsey Skirt is one of the few skirt patterns I would seriously consider knitting. The Best-Fit Jumper is charming and fun”. About.com has a review as well. Here is the short list from them on their favorites: “There are so many patterns I love in this book. I could easily see myself knitting and enjoying probably 12 of the 19 patterns, if I had that kind of time and devotion to a single knitting book. I was happy to have Kazumi included in the list, and the book is delightful. The Daily Knitter has a review as well, from the Knitting Scholar. So, two reviews in three places thus far. This particuarl design was a little different for me. It is the first one with side shaping and the fist one with a full fledged set in sleeve. I have not done that much shaping in a garment before. I have tended to stick with more traditional shapes and styles, but when your emphasis is simple, you incorporate other design elements to make your statement. Sure, this sweater could have had no shaping. But it would have lost something in the translation. That delicate eyelet lace would have been lost in the translation on the bottom of a more boxy sweater. A lot of the beauty in this garment is how the eyelets fit into the ribbing, and the patterning of the ribbing as the shaping moves into and out of the waist. It needed those extra design details in the shape of the garment. Those are things that as the book talks about you might not notice at first, but they come together to give you a successful and elegant design when using few stitch pattern elements. In Fashion we see this, and designers such as Coco Channel were famous for deceptively simple and elegant designs. Designs that relied on meticulous attention to shaping detail and construction as design element, as well as other more obvious elements such as stitch pattern or other decoration. If you were, for example, knitting a plain stockinette sweater there are all kinds of subtle details and shaping that become very, very important. How the decreases or increases are worked on the sleeves, can that be turned into a design element and can that also be mirrored in the armhole for example. What kind of cast on you use. The texture of the yarn you use. How much ease does the garment have and do you have a straight shoulder, or did you work the shoulder in steps so that the shoulder is sloped and fits the body better? It hangs better on the body, and generally one inch is sufficient. BO the stitches in even groups at the beginning of the shoulder rows (for one shoulder it will be on RS rows, for the other it will be on WS rows because each shoulder will not have the beginning of the row at the edge with the shoulder at the beginning of the edge on the RS rows), or you can put them in hold by short rowing and work a three needle bind off or seam the shoulders together when you are done. Attention to finishing becomes very important as well. I get to see some pretty interesting knitting sites from time to time with the web ring that I have for knitting design. I get some submissions that I have to unfortunately tell the person who submitted their site to the ring that their site just doesn’t fit the ring. But holy cow. Johan Ku, a Taiwanese designer, is different. I have to confess I feel somewhat humbled at the submission. This is a fashion site, which is different than the niche we are in. There are some who would argue otherwise, and in some respects while we do have concerns with fashion, as our garments do have to be fashionable and there is some overlap, the markets are different. Ours is more tied to the hobby industry, with specific regards to the needle arts industry. There is some really interesting high fashion knitting going on here. If you are into runway fashion and want to see some pretty amazing knitting, take a look. It isn’t something you would wear to a football game, or to go to the antique stores on a crisp fall day…but then again, that isn’t what runway fashion is for. This man is a real designer. This is something I admittedly struggle with, feeling like a real designer. I can only look at my accomplishments in the amount of time I have done them in, and how I conduct myself in my business, as I have no formal training in fashion. I have no formal training in knitting either. I am a self taught knitter and by and large a self taught artist. I have had some formal education, but I have had more learning on my own. My father is a retired teacher, and I have said before that he has said I “don’t know it is supposed to be hard”. I don’t know that I would go that far, I think it is more that I refuse to think about it being hard. I focus on what I want. If I focus on what is hard it is too easy to give up and get discouraged. If I focus on what I want, I make better decisions and reach my goals easier. If I were to define what a real designer is, I would I suppose point first to the fashion industry, with it’s runways. Art reflects culture besides shapes it, and fashion at that level is art. Perhaps the reason I have trouble thinking of myself as a “real” designer is because of lack of formal training, as well as this niche being part of the hobby industry. I don’t dwell on it, it just pops into my head at unexpected moments like today when I looked at this website and felt like I should be the one joining his web ring, not the other way around. That being said, I design in a very fine art way, and we all have our own insecurities. In this country generally speaking you cannot go to college to be a knitting designer, so it is up to the individual to define and validate in other ways. There are ways to be a professional and the Association of Knitwear Designers, which I am a member of, is working to define what a professional knitting designer is. We are also working to establish standards for knitting designers within our industry. Education is on our list too, but there is only so much time a volunteer force of business women have. What I discovered when doing research for the design though was fascinating. Peaches came from Asia and have a long history, not only in Asian culture but here in the States as well including the reconstruction following the civil war. However, I did not want to focus on any of that stuff. I wanted more of an in that moment kind of story. So I thought about the last time I had a fresh peach. The last time I had a ripe summer peach was when I had one from the tree in Katherine Misegades back yard. Now, hers isn’t a Sun Crest or Elberta or one of those famous heirloom varieties, but it was a tasty little peach and I enjoyed it. The imagery alone of a fat, round, juicy peach, sweet with the sunshine of summer and dripping off your chin when you bite into it on a lazy summer day, is worth sending any of us to the produce section summer after summer despite any disappointment at never finding the peach that lives up to that memory. Part of that memory is a collective consciousness I think, a yearning for a time when life was slower and we felt more connected. When you do bite into a particularly satisfying Peach, you share in that collective consciousness despite it being a very much in the moment experience. I wanted my design to be all about that one split second where you bite into that peach and your mind is transported. During my research I ran into a farm just southeast of Fresno in California (on the Internet, of course) that by happy coincidence is all about what I am trying to express in my design. So much so that I almost changed the name of the design to South of Fresno! The Masumoto Family Farm is well known in culinary circles for their Sun Crest and Elberta peaches. David Mas Masumoto is both farmer and eloquent writer, and in his book Epitaph for a Peach, four seasons on my family farm he shares his passionate story about his journey to rescue a sweet and tasty fruit. Rather than take bulldozers to his orchards and plant more commercially acceptable varieties, he found a way to make his farm work with heirloom varieties that are just plain better, taste wise, than their more commercially viable counterparts. Rather than sacrifice quality, he found a way of life on his farm, which has been organic for the last 20 years and has been in his family for three generations, and his heirloom peaches and writings have raised an awareness of what Peaches are meant to be. That the memory of what they can be is really not just in our collective imagination. One of the unique programs on this farm is their adopt a tree program. You can adopt an Elberta tree, and when it is time for the peaches on your tree to be harvested, then you have two Saturdays in a row to come harvest your succulent babies. 400 to 500 pounds per tree. Let me tell you, there is a waiting list. There are Chefs on this waiting list eagerly planning all kinds of things with peaches. There are a limited number of Elberta’s they do this with. Then of course there are the Sun Crests which are available, but those are not self harvested. Mr. Masumoto has authored some 8 books, writes a column in The Fresno Bee, has contributed to USA Today and the Los Angeles Times. He is well known amongst culinary professionals and his peaches are treasured as gems. He has an impressive list of accomplishments, but what really drew me to his story was his picture and the words that spoke of his family, his ties to his land, and his spirit. His faith to slow down and offer not just something better, but the real thing. That is what I want for you in that bite of your peach.